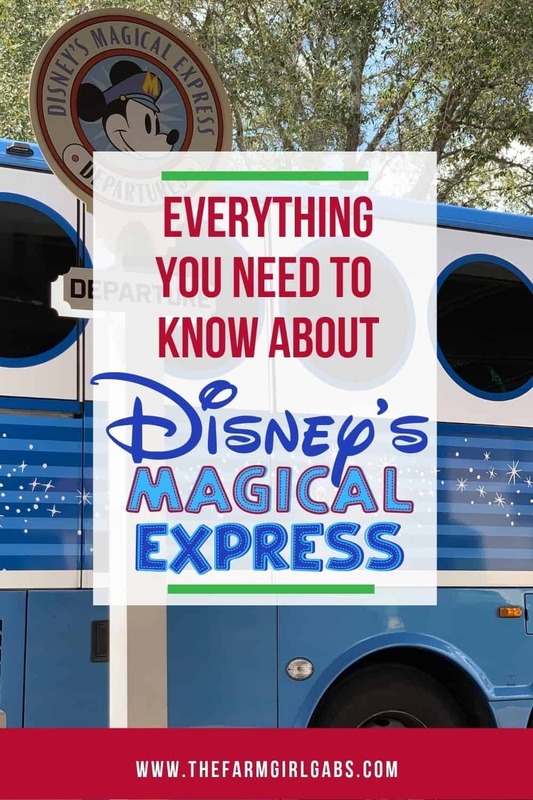 If you have never taken Disney’s Magical Express, you may have a lot of questions about how it works and where it goes! If you are staying at a Walt Disney World Resort Hotel, you can take advantage of Disney’s Magical Express to help you get to and from the airport at no additional cost! If this is your first time taking the Disney Magical Express, here is everything you need to know before you ride! What can I expect when riding Disney’s Magical Express? Disney’s Magical Express is essentially a charter bus system. They have screens on the bus that play old Disney cartoons while you’re boarding and waiting to get off the bus, and while you are riding, they play informational videos about Disney that you may need to know. The seats are fabric and sit two to each area. If you are traveling with a larger party, this means you might not be able to sit together. How Do I Reserve My Magical Express Reservation? As I explained previously, Disney’s Magical Express is a complimentary service that is included with your Disney Resort Reservation. If you have your flight information when you book your stay, you can give your arrival and departure information to the booking agent. If you did not book your flight yet, you will have to call (407) 939-1936 with your flight information. After you’ve made your reservation, information about Disney’s Magical Express—including luggage tags—will be mailed to you approximately 2 to 3 weeks prior to your arrival. 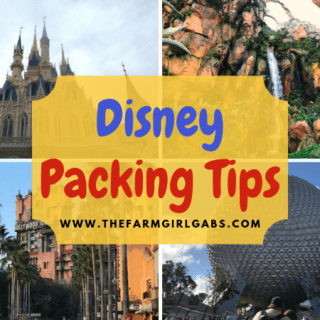 Attach Disney’s Magical Express luggage tags to each bag that you plan on checking that you would like delivered to your Resort hotel room. 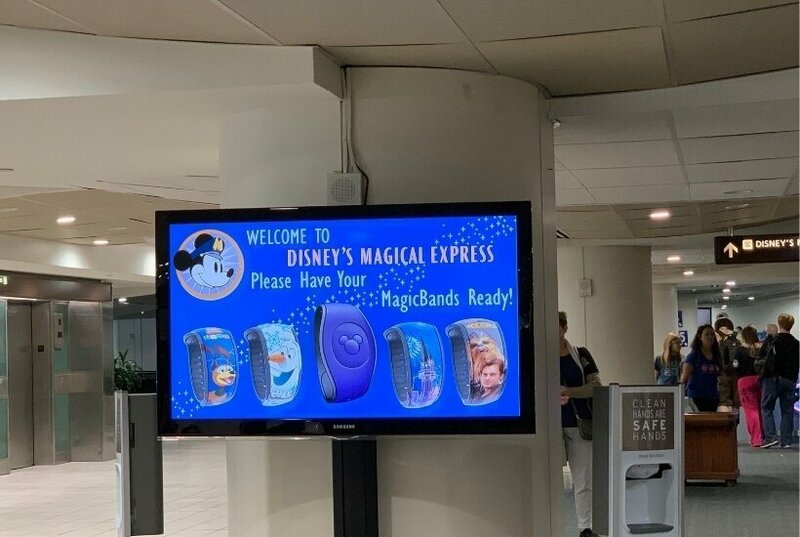 If you did not receive your luggage tags prior to leaving home and are scheduled to arrive in Orlando between 5:00 AM and 10:00 PM, you can simply provide your baggage claim numbers upon arrival at Disney’s Magical Express, and they will take care of the rest. Pro Tip: Remember not to pack your MagicBands in your checked luggage, as they will be used to check in with Disney’s Magical Express and to unlock your room when you arrive at your Disney Resort hotel. If you have not received your MagicBand, please be prepared to present your Disney’s Magical Express documents (which will be mailed separately to you) to board the motorcoach. You will receive your MagicBand upon arrival at your Disney Resort hotel. Can I take Disney’s Magical Express from any airport? As of right now, this service is only available from the Orlando International Airport. When you book your resort, you will be able to take advantage of Disney’s Magical Express at no charge. Two weeks before your check-in date, Disney will mail you luggage tags for any checked bags, as well as transportation vouchers for the bus. When you arrive at Orlando International Airport, you will want to head to the main terminal, side B, level one to catch your bus. Once you get there, a cast member will scan your Magic Band and let you know which lane your bus will be departing from. When your bus arrives, you will be directed to board. When can I ride Disney’s Magical Express? Disney’s Magical Express provides transportation to and from the airport, but only for those with a reservation. Disney has buses traveling pretty much around the clock to get you to and from the airport. If you don’t have a reservation, you will need to book your ride with someone at the front desk of the Disney resort you are staying at. To ensure you don’t miss your flight, this will mean leaving 3 hours before your departure time. Keep this in mind when booking your flights. Do they provide a luggage service? If you are flying before 10 pm, you can use Disney’s Magical Express luggage service to have your bags delivered straight to your hotel room! It should be noted that this delivery service can sometimes take three hours or more to deliver your bags, so don’t choose this option if you need to access your bags quickly. You will need to sign up for this service in advance, and it does come with an additional fee. Disney’s Magical Express will make stops at other Disney resorts to pick up guests. While they don’t go around to every single resort, they will stop at any resorts that are near yours. Due to this, sometimes that will mean spending a little extra time on the bus ride. Guests must be at least 12 years or older to ride Disney’s Magical Express without an adult, so keep this in mind if you have young travelers with you. I hope this post has helped answer all your questions about Disney’s Magical Express! Using Disney transportation can help you save a ton of money on transportation while you’re at Disney World, and Disney’s Magical Express is no exception!